I’m not sure what all Southwest Airlines is doing on Mother’s Day. 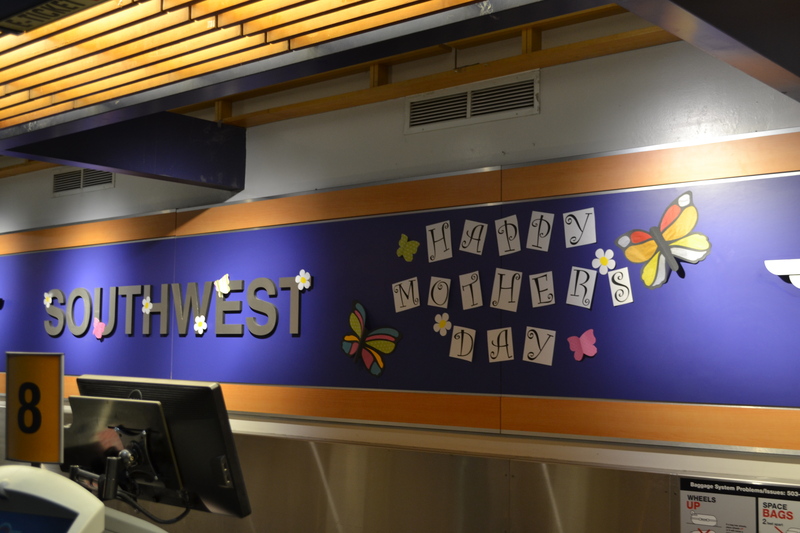 However, on the day before Mother’s Day, in the Portland airport, here’s how Southwest decorated behind the check-in counter. None of the other airlines had anything at their check-in counters.. Even though I have this impression of Southwest being a cheap and budget airline, it’s little touches like this that make me have a much more favorable impression of them. This was a small gesture. However, you definitely did something different to stand out on Mother’s Day weekend, and this traveler noticed. Not only that, but they gave mothers a free drink on flights today! Southwest is much, much more than a budget airline to me and they are one of the few companies (and only travel company) I am completely loyal to. I adore hem and most everything they stand for. And you know me so you know this isn’t spam, haha! Thanks for the comment Shannon! What other experiences have you had with Southwest that make them a company you have so much good will toward? Just cuz someone know you don’t mean it ain’t SPAM. How do ppl know you ain’t workin for Southwest? Ha! Fair point, “ppl” don’t actually know me in real life, as Carrie and Jonathan do. I would have told them if I worked for Southwest (in addition to my career and my full-time job as a mother). Andplusalso, if I DID work for Southwest, I sure would be traveling a lot more than I do now! Jonathan, they have done oh-so-many things. I’ve been flying with them for probably 16 years now. In Nevada, I did a lot of work for the state and the cheap flights between Reno and Vegas were as close to a bus service as you could get. Everyone knew everyone on the flight, everyone knew the schedule by heart, and there was a great sense of camaraderie. That’s just where my love started, though. They have an incredibly strong corporate culture which places the highest value on customer service. Not only that, but the majority of employees actually BELIEVE in this and are given the freedom to exercise this. I would say one in 5 flights (more?) has one of the wittiest safety explanations you’ve ever heard. It actually makes you WANT to pay attention. I’ve heard multiple flight attendants sing really incredible songs over the intercom, and generally let their personalities shine. They are having fun and it makes you have fun too. Here’s a personal example: some dear friends of ours wanted to surprise their daughter for her 16th birthday. Not only did they blindfold her for the drive to the airport, through security and on the plane, they convinced Southwest to NEVER announce the destination on the flight! They would say things like “We’re halfway to… wherever we’re going,” all for the sake of this surprise. What other company would do that? Such a fun thing that didn’t hurt anyone and probably helped build some fun and mystery into everyone’s trip. (Because really, everyone else knew where they were going anyway). Finally (because I need to sleep), they have the BEST in-flight magazine. Ever. I honestly wish there was a way to subscribe and I am always thrilled when my flight happens to cross into two different months because then I get 2 magazines. The magazine’s website does little to show it, but it also has some of the greatest design and graphics. The plain text just doesn’t do it justice. Hopefully this doesn’t convince Jim even more that I must be some super secret trade spy (But hey, Southwest, if you’re hiring…! ), but does help you see a little bit why I love them. Like other very strong brands (Apple, etc. ), they have a strong sense of who they are and why they do what they do. They do corporate culture trainings for other companies. (I just remembered another reason: their president for 10+ years was a woman, Colleen Barrett, and she founded their corporate culture committee, which I think was hugely important to the company and its beliefs).